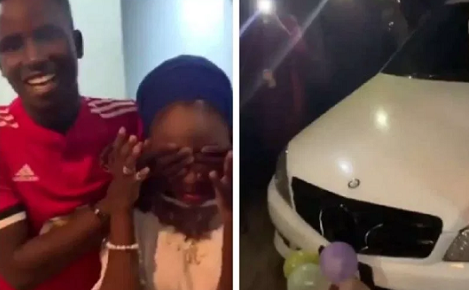 A 19-year old Nigerian boy, Zubairu yesterday surprised many when his girlfriend, Nihat turned 16 and he presented her with a Benz SUV, iPhone X Max and an iWatch. This happened in Abuja as his friends cheered him on. He even customized the jersey he wore with her name. Zubairu is an 100 level student, while Nihat is still in SS3. An ss3 student out by that time , she no get parent?